The university has officially removed Ed Meek’s name from Farley Hall, leaving an open space for a new namesake of the School of Journalism and New Media. The removal took place during winter break, when most faculty and students were away from campus. While many faculty members are unsure of the exact date that Meek’s name was removed, Assistant Dean of the School of Journalism and New Media Jennifer Simmons said she believes it happened on Dec. 17 or 18. The name came down following months of discussion after Meek published a post on Facebook that members of the Oxford and Ole Miss community condemned as racist. One solution the university devised to mend relations after the Meek controversy began last September was the Common Ground Committee, which is composed of faculty members. Simmons serves as the committee chairperson. The first recommendation made by the committee was to offer implicit bias training for the journalism school faculty. The training was conducted by Vice Chancellor for Diversity and Community Engagement Katrina Caldwell the week before classes began. “The committee is working on making more suggestions to the dean about things that, as a faculty, we could do within the classroom to encourage inclusion, acceptability and open-mindedness while still reserving people’s right to free speech,” Simmons said. Now that Meek’s name has been officially removed from the school, Simmons said, the committee is planning to cut back its weekly meetings to bi-monthly in order to give its members time to draft final committee recommendations for Will Norton, the Dean of the School of Journalism and New Media, by April. Meek publicly responded to the removal of his name in another Facebook post on Dec. 27. Meek’s original controversial post featured photos of two black female students alongside commentary about declining enrollment rates at Ole Miss and lowering property values in Oxford. In his response to his name being removed, Meek continued to write about his African-American roommate from 1974 and how Meek aided in the integration of local public schools. Meek did not respond to requests for an interview with The Daily Mississippian. The formal removal of his name leaves an opening to rename the school in honor of someone else, and while the university has made no official progress in renaming the school, many people on campus have offered their ideas for a replacement. The suggestion of Ida B. Wells has gained notable traction, with her own great-granddaughter Michelle Duster supporting the campus movement along with opinion writers for national news outlets like The New York Times and the Associated Press. Born a slave in Mississippi, Wells went on to become an activist against racial violence and an investigative journalist. 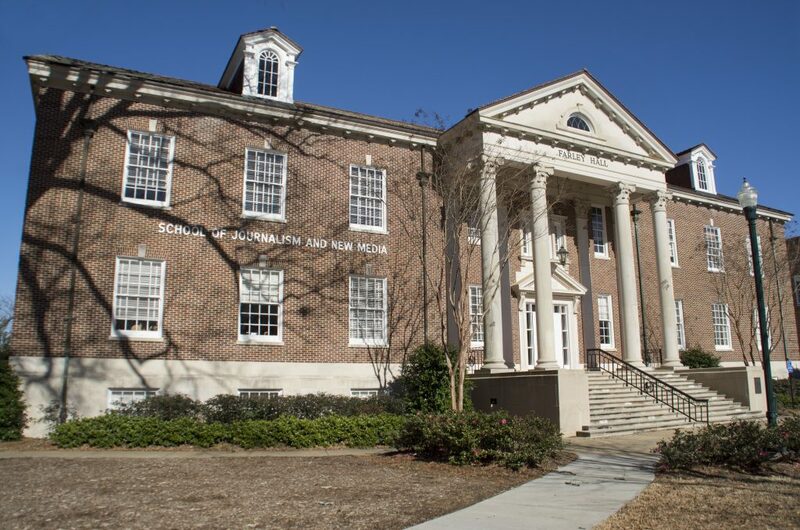 In addition to renaming the journalism school after Wells, students and members of the faculty have suggested the creation of reparative scholarships for black journalism students. Simmons emphasized that the Common Grounds Committee did not play any role in the petition to rename the school after Wells. In October, Rod Guajardo, a university spokesman, said it was “premature” to discuss renaming the building. Since the statement, Guajardo and other communications officials have not responded to requests for an updated statement.